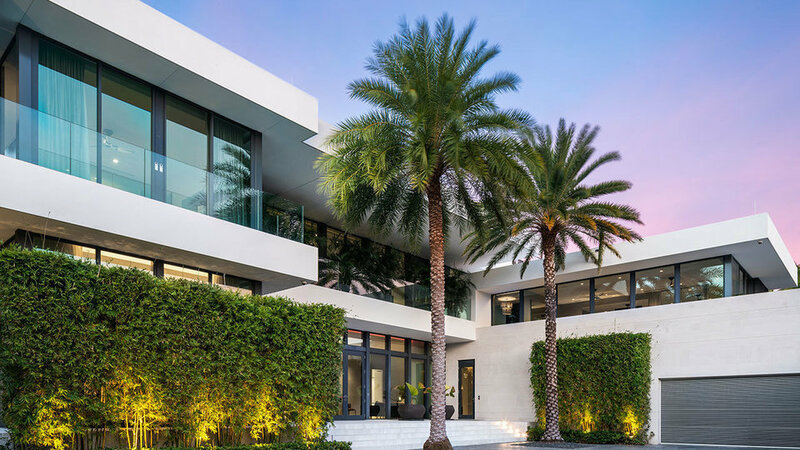 A sleek glass and marble contemporary on Miami Beach’s exclusive and guard-gated Hibiscus Island was listed Tuesday for the first time for $29 million. The 10,780-square-foot house on North Hibiscus Drive, which pays homage to the French hôtel particulier style of architecture, has seven bedrooms, seven full bathrooms (each with a Jacuzzi and stand-up shower) and one partial bathroom. It sits on a 21,000-square-foot lot, boasting 120 feet of water frontage with wide-angle water views. The contemporary was designed by the Miami-based architects at Touzet Studio, with interiors by Linda Zarifi Design and landscaping by Enea Garden Design. It was finished about 18 months ago, Mr. Hertzberg said. The furnishings are not included, but could be part of a separate deal with Mr. Vogel. Mr. Vogel was not available for comment. “Because he was building it for himself, he did some fun things,” Mr. Hertzberg said, including a James Bond-style liquor cabinet in the media room, with hidden storage that opens from behind a shelving wall unit and a 50-foot geothermal swimming pool with an elaborate massage jet system. Another fun touch was the rooftop, which was inspired by the flying bridge of a yacht. It features a wet bar, dumbwaiter coming straight up from the main kitchen, fire pit, Jacuzzi and an outdoor shower and kitchenette. Blue de Savoie marble, the same stone used in the Louvre in Abu Dhabi, was used throughout the home, he said, including 10,000 square feet of exterior space. Other architectural and design features include exterior glass walls that open, 14-foot ceilings, a large-scale grand staircase with night lights, LED cove lighting that changes colors, art wall reinforcements throughout, a gas fireplace, separate meditation room, and a user-friendly Crestron-controlled smart security system. The chef’s kitchen, which was custom made in Switzerland, features appliances by Gaggenau and Teppanyaki, including a steam oven, two dishwashers and two refrigerators. The kitchen also features a Sub-Zero walk-in wine cellar with two Champagne refrigerators and a service entrance with a ramp. It is kosher compatible, with four sinks. Six of the seven bedrooms offer unobstructed water views. The upstairs master suite features Nero Marquina marble flooring, a large boutique-style closet and a rain shower in the bathroom. The gym includes a separate massage room, steam room, expansive shower and an outdoor yoga terrace. There is also a staff apartment with a full bathroom and kitchenette. Outdoor amenities include a new boat dock scaled for up to a 100-foot vessel with a separate lift for two jets skis, an environmentally friendly green roof, a new higher-than-normal seawall, barbecue area with screen projector, and palm trees imported from Arizona. There is room for about 15 cars on the property, including a two-car garage, carport for four cars and a large driveway. Hibiscus and Palm islands are two guard-gated, man-made islands with high property values that are off the MacArthur Causeway in Biscayne Bay between Miami and Miami Beach.